Born on 11th March 1920, Prof. Bartholomeauz Aristides Abeywickrama had a brilliant school career firstly at St. Aloysius College, Galle and later at Royal College, Colombo, where he won many academic honours. Thereafter, he showed exceptional merit at the Ceylon University College, Colombo, from 1937 to 1941 as an undergraduate where he won a Cambridge Studentship, an Entrance Scholarship in Botany, and the Sir Marcus Fernando Scholarship. While still an undergraduate, he was appointed as an Additional Assistant Demonstrator in Botany by the Ceylon University College in 1938 and this marked the beginning of a long, dedicated and loyal service to the University system in Sri Lanka which is hard to match. After graduation from the University of London in 1941, having been a student of the Ceylon University College, he was appointed by the University College in 1942 as an Assistant Demonstrator in Botany. He proceeded to Cambridge, UK for postgraduate studies on a Government Science Scholarship in 1946 and obtained his PhD Degree in 1949. He returned to Sri Lanka and served the University of Ceylon as a Lecturer until his appointment as the Professor of Botany of the University of Ceylon in 1965. Professor Abeywickrama’s contribution to the University system in Sri Lanka in general and to the University of Colombo in particular is without parallel. He served as the Dean of the Faculty of Science, University of Ceylon, from 1966 to 1969. In 1967, he served as a member of the Academic Advisory Committee for the proposed University of Colombo. He served as the Vice- Chancellor of the University of Colombo, Ceylon from 1969 to 1972. 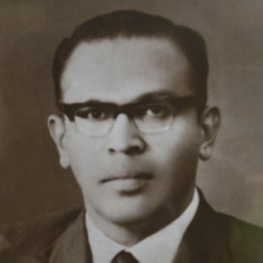 With the bringing together of all Universities in Sri Lanka under one University, namely the University of Sri Lanka, Professor Abeywickrama had the singular honour of becoming its first Vice- Chancellor in 1972, which position he held until 1974. Professor Abeywickrama’s contribution to the advancement of Science in Sri Lanka is equally praiseworthy. He has held positions in many Scientific Associations and Statutory bodies. He was the Chairman of the International Biological Programme Committee for Sri Lanka from 1968 to 1973, the UNESCO Man and the Biosphere Committee from 1974 to 1983, the Coconut Research Board from 1977 to 1983, Coconut Cultivation Board from 1977 to 1979, the Research Committee of the Sri Lanka Tea Board in 1989, and NSC Sri Lanka Flora Revision Advisory Committee from 1990 to 1998. He held the post of President of the Ceylon Natural History Society in 1961, the Sri Lanka Association for the Advancement of Science in 1968, the Sri Lanka National Academy of Sciences from 1980 to 1981 and the Sri Lanka Institute of Biology from 1983 to 1984. He has also served as a member of the UNESCO Advisory Committee to the Director General on Humid Tropics Research from 1952 to 1964, the Fauna and Flora Advisory Committee from 1958 to 1981, the Sri Lanka National Science Council from 1968 to 1977, the Council of Association of Commonwealth Universities from 1972 to 1973, the Agricultural Development Authority from 1978 to 1979 and the Palmyra Development Board from 1978 to 1980. Professor Abeywickrama is a renowned authority on Plant Taxonomy and Ecology and more recently he has shown a great interest in conservation aspects. He has participated in many international conferences by invitation or as the official Sri Lankan delegate. He has over fifty publications to his credit; a true indication of his scholarship. Professor Abeywickrama retired from University Service in August 1985. In appreciation of his 47 years of active and dedicated service to the University system in Sri Lanka, the Senate of the University of Colombo conferred on him the title of Professor Emeritus in September 1985. Professor Abeywickrama continued to assist in the teaching and research programmes in the Department of Plant Science (Botany), University of Colombo, even after his retirement for many years; an indication of his dedication to the University and to Science. Professor Abeywickrama is a great scholar and an academic of the highest calibre. In recognition of his long and dedicated service to the University system in Sri Lanka in general and to the University of Colombo in particular, and in recognition of his invaluable contribution to the advancement of science and research in Sri Lanka, the University of Colombo, Sri Lanka, conferred on him the Degree of Doctor of Science (Honoris Causa) at the Convocation held in Colombo on 14th December 1985. The conferment of the Honorary degree was considered as a fitting honour bestowed on a distinguished scholar and an academic of the calibre of Professor B.A Abeywickrama. Source: Citation for the Conferment of the Degree of Doctor of Science (Honoris Causa) on 14/ 12/1985.